Heel Height: 2.25”. Color: Black. Weight: 14.4oz. Premium leather or suede upper in a feminine open toe wedge. Stylish cork-wrapped wedge. Smooth breathable leather lining. I will do my best to provide the best service and the best price. Man-made outsole. Shoes are pre-owned with normal wear. Bottom soles are slightly dirty from previous wear. Shoes are still in good condition. Length (Heel To Toe): 11.25". Length (Insole): 10.75". Width: 3.75". New Sofft Corinth. Cork-wrapped wedge. Slingback strap buckle closure. Premium leather upper. Leather lining. Durable outsole. These are a pair of Sofft 1224901 leather open toe slingbacks sandals. Sharp looking sandals by Sofft. White leather uppers~~~Rubber soles~~~Widest part of the sole is almost 3 1/2"~~~Heel to toe of insole is 10 3/4"~~~Adjustable ankle strap~~~Heels are 3" high. Size stated on shoes US 10. Cork platform. Height: 4.25”. Burgundy/ Red. Style#: 1525018. B rand New, without box! 50% OFF || BUY ONE GET ONE 50% OFF || ENTIRE STORE Or FREE || BUY TWO GET ONE FREE || ENTIRE STORE. Size 10 Women's Sofft Leather Upper Lining Sock. Man Made Balance Material. Leather Foot Bed. Split Toe, with Tan Bold Stitching around the Foot Bed. Has a Flower Designed going across the upper Foot Part. The bottom soles are slightly dirty. Insoles:11". Heel to Toe: 11". Style - #1267290. Sofft Wedge Sandals. Style: Wedge Sandal. Faults and defects as well as highlights are described. Approximate Heel Height: 5". Sole: Rubber. Widest Part of Sole: 3.25". US Size 10 M.
The uppers are woven leather. The bottom soles are rubber and the heel height is 1 3/4". Slingback with Buckle. Wedge Heel. 7/8" / 2.22 cm Platform. Cross Strap Design. Gold Leather Trim. Size: 10 M. ~. ~ Features high-quality leather uppers with snake print leather detailing, adjustable buckle strap, 3 3/4" heel (7/8" platform), padded footbed, rubber soles, with the trendy style, quality and comfort of Sofft. Studded vamp. - 4.75" Stacked heel. - Adjustable ankle strap with buckle closure. LINING SOCK. WOMAN SANDALS. LEATHER UPPER. COLOR BROWN. Leather upper and sock liner. Man-made sole with cork look. Double strap over top of foot with buckle (bronze color) connecting the two. In excellent used condition. Style number 1281050. A rugged buckled bootie in rich, burnished leather. Stacked heel. 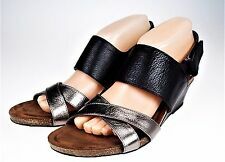 Women’s Sofft Open Toe Sandals, Slip On, Black Leather, 4” Heel, Size 10M. Sandals are in excellent condition with minimal wear. The uppers are woven leather. The platform is cork. The bottom soles are rubber and the heel height is 2 3/4". Style Number: 1039001. Style: Mules, Clogs, Wedge Heels. Features: Slip On, Pleated Pebbled Leather. Color: Black. Length (Heel to Toe): 10.75". Condition: Pre-owned condition. Shows signs of normal wear, including scuffing. Platform: 1". Insole length: 10.1/8". 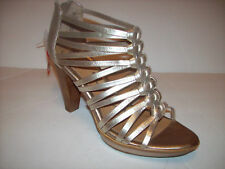 NEW SOFFT WOMEN SLIP ON SANDALS # 10 M EU 42 M GOLD LEATHER. THE HEELS AND SOLES ARE IN PERFECT CONDITION. Worn only once. In fantastic shape! Hand cleaned. Photos are of the actual shoes. No original box. Inventory# 595/193-054. Style - #1267290. 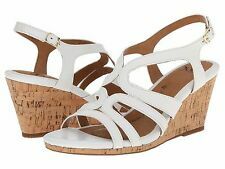 Sofft Wedge Sandals. Style: Wedge Sandal. Faults and defects as well as highlights are described. Approximate Heel Height: 5". Sole: Rubber. If in any way you are less than 100% satisfied, every reasonable effort will be made to make you happy. Open Toe High Heel Sandals.